Keeping customers engaged throughout their unique mobile journey is a challenge that brands across the globe are continually striving to solve. Among the many factors involved in this challenge, one in particular has emerged that is presenting an especially serious threat – ad blocking. Now, if there is no perceived value in content, consumers can increasingly turn to ad-blocking tools to prevent unwanted content from loading on their mobile devices. While ad blockers have been available for desktop Web browsers for some time, Apple’s announcement to allow ad-blocking applications in the app store coupled with comments from mobile operators about network-based ad blocking has created a new wave of anxiety for marketers. The result is a call to action for brands to come up with creative as well as contextual ways to reach their customers in order to avoid having their valuable content blocked. 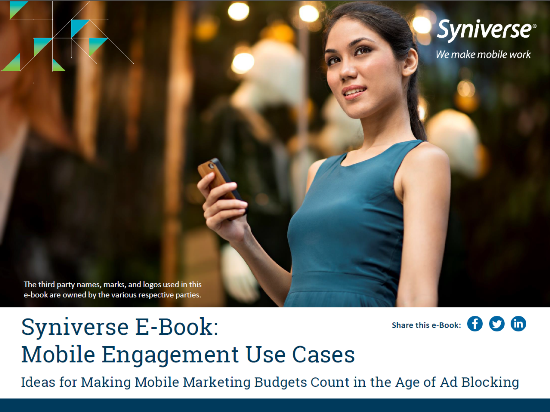 To help brands with this transition, Syniverse has developed a Mobile Engagement Use Cases e-book that outlines the ways that brands can use mobile to enrich their customers’ journey and circumvent ad-blocking tools. Specifically, our e-book outlines how brands can serve relevant content that reaches their customers in the mobile moment through communications such as promotional messages, transaction alerts, loyalty notifications and customer-service tools. I invite you to take a look at our e-book. How many of these use cases apply to your business? What other mobile use cases are you seeing that are effective in your industry? I would love to get your thoughts. Elizabeth Carbone joined Syniverse in 2013 and is focused on developing both content and messaging strategies for Syniverse’s Mobile Engagement, Cross-Channel Messaging and Phone Number Verification solutions. Among her responsibilities, she helps manage market research and analysis for customers to provide perspective on where mobile is heading and how companies can use research data to foster stronger mobile engagement with their customers. She also uses this data to create a variety of research and marketing materials – such as infographics, how-to guides, and presentations – to help companies in the vertical markets that Syniverse focuses on. Prior to joining Syniverse, Elizabeth worked as a Graduate Assistant at the University of South Florida and a Sales and Marketing Manager for her family’s commercial landscaping business. She holds a Master of Science degree in marketing and a Bachelor of Science degree in marketing and management from the University of South Florida. I was very impressed by your article regarding ad blocking. Job well done.